Had it not been for a long-term relationship and friendship with a Benedictine nun and their shared anti-war position regarding El Salvador decades ago, Georgianna Duarte may have ended up penning articles like this and never made it to Indiana State University. Instead, under the wing of her newly found mentor, Duarte's dreams were redirected toward advocacy for children's rights, and a decades-long career in education led to her appointment as the A. Elwood and Juneth S. Adams endowed professor and chair of the department of teaching and learning at State. "I never would have gone into education if not for recognizing those in my life as mentors. Sister Roseann was the one who opened my eyes to human rights through the lens of children," Duarte said of the nun she still visits each year in Pennsylvania. "I always thought I would be a journalist and travel the world, but I have had the opportunity to write several books and articles. Through my own curiosity and will, I traveled the world anyway." Now she's ready to tackle something new at Indiana State. "For me, it's an important responsibility to serve in this position and make sure that I really strive to fulfill the expectations of student success, inclusion and diversity," Duarte said of her role as endowed professor and chair of the department of teaching and learning. "I not only want students to finish their degrees but always see themselves as lifelong learners and see that the global community is their home because engaging in diverse experiences and countries forever changes your perspective of who you are. Relationships matter, and so our community is where it begins. The university's first endowed professorship was established through an endowment with a current market value of $920,000 pledged by Indiana State Normal School alumnus A. Elwood Adams and his wife, Juneth, to support teacher education and teacher preparation in the college, including support for an endowed professor's research and development. A 1927 graduate of Indiana State Normal School, Adams had a notable 44-year career in education as a teacher, principal and superintendent and was awarded a Distinguished Alumni Award from the Indiana State University Alumni Association in 1986. "Dr. A. Elwood and Mrs. Juneth Adams were loyal friends of Indiana State who generously supported the university through their estate, and the Bayh College of Education is bringing to fruition the Adams' vision of faculty support through the creation of the A. Elwood and Juneth S. Adams Endowed Chair," said Ron Carpenter, vice president for university development. Three years after the position's parameters and requirements were crafted and a national candidate search completed, Duarte officially landed in Indiana in August. "This is a full circle moment for the college and for the institution," said Kandi Hill-Clarke, dean of the Bayh College of Education. "In the world of academia, named professorships are prestigious. It's an honor and privilege that speaks to Dr. Duarte's expertise in the field of early childhood education and her national recognition as a teacher and scholar. 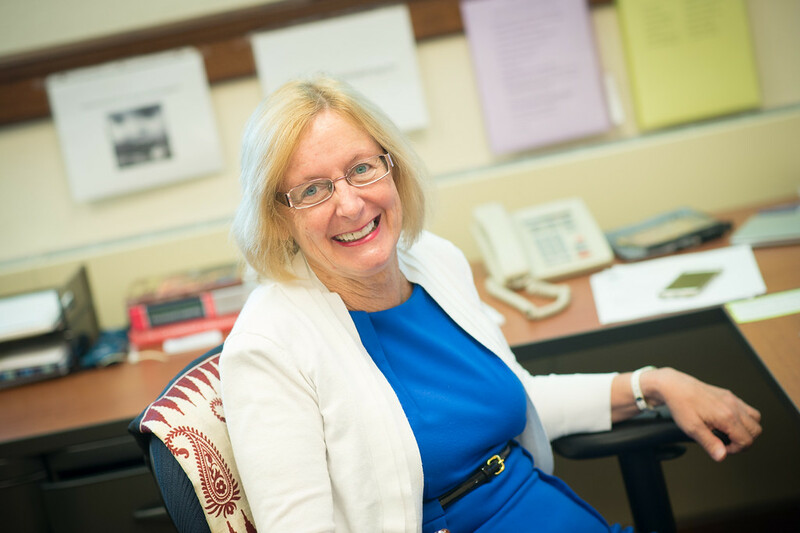 We are very fortunate that we were able to recruit her to join the Bayh College of Education family." "The position is a fantastic jewel for the university and is a show of confidence in our work. It is something we hope to see the university do more of in the future," said Mike Licari, Indiana State's provost and vice president for academic affairs. "I'm excited to see what Georgianna will be able to do here, and I'm glad to have her on campus as the university's first endowed professor." Duarte started her career as a teacher at Head Start and Migrant Head Start and later worked in inner city schools and as a consultant in Indian Head Start. For more than 40 years, she has served as a consultant for the Office of Head Start in Washington, D.C. She would also serve on faculty at New Mexico State University and University of Wisconsin-Milwaukee before going to the University of Texas Rio Grande Valley, where she spent nearly half of her 41-year career as a professor until her retirement in 2015. "My background is in early childhood, but it has always focused on language issues, which is really talking about equity and human rights. Social justice has always been my focus, and I've always had my eyes on children's rights," she said. "It's taken me all over the world - Western Africa, the Middle East, Nepal and years collaborating in Peru and Chile. I have been in bilingual education for almost my entire career, and I think my early experiences working with children who have come to this country from refugee status opened up my path of interest." With a doctor of philosophy in curriculum and instruction from Pennsylvania State University, a master's in elementary education from Edinboro State University and a bachelor's in early childhood education from Georgia State University, it's no surprise Duarte says she believes that the strength of every community is in the quality of its early childhood program and has high hopes for the impact Indiana State's Early Childhood Education Center can make in the community. "When people in disciplines across campus see the center I want them to say that it is the place to conduct observations and research while it also provides high quality services to children and families," she said. "When you improve the quality and comprehensiveness of an early childhood education center everybody wins." The university's first endowed professorship was established through an endowment pledged by Indiana State Normal School alumnus A. Elwood Adams and his wife to support teacher education and teacher preparation in the Bayh College of Education.